We just learned about the Talocalcaneal Ligaments. 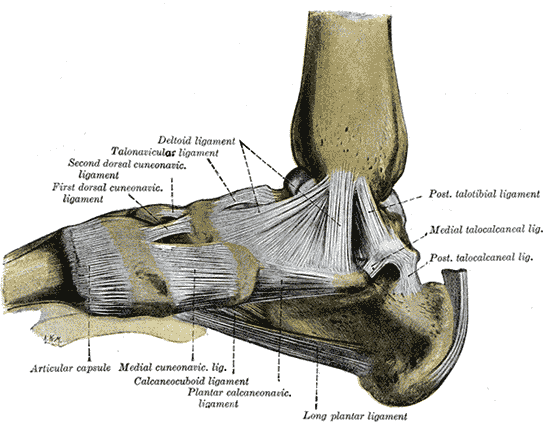 Another bunch of ligaments are the Transverse Tarsal Ligaments. Remember the location words, like dorsal means on top, plantar means on bottom, bifurcated means split into two. There are 7 ligaments that tie all these together. - dorsal talonavicular: Connects the talus to the navicularis on the top. - plantar calcaneonavicular: Connects the calcaneus to the navicularis on the bottom. - bifurcated (calcaneonavicular): Splits into two and connects the calcaneus to the navicularis in the middle. - dorsal calcaneocuboid: Connects the calcaneus to the cuboid on the top. - long plantar: Connects the calcaneus to the cuboid on the bottom. It is the longest of the foot ligaments. - plantar calcaneocuboid: Connects the calcaneus to the cuboid on the bottom. It is shorter than the long plantar and connects at a different spot. - bifurcated (calcaneocuboid): Splits into two and connects the calcaneus to the cuboid bone in the middle.